a closer look reveals some of the most elegant art anyone on the planet ever created. Thailand is a different culture than India, and it turned ideas from India into its own way of processing reality. Thai culture usually avoids monumental things and focuses on the human scale. But I find its creations as magnificent as anything the West, or India, or China ever made. 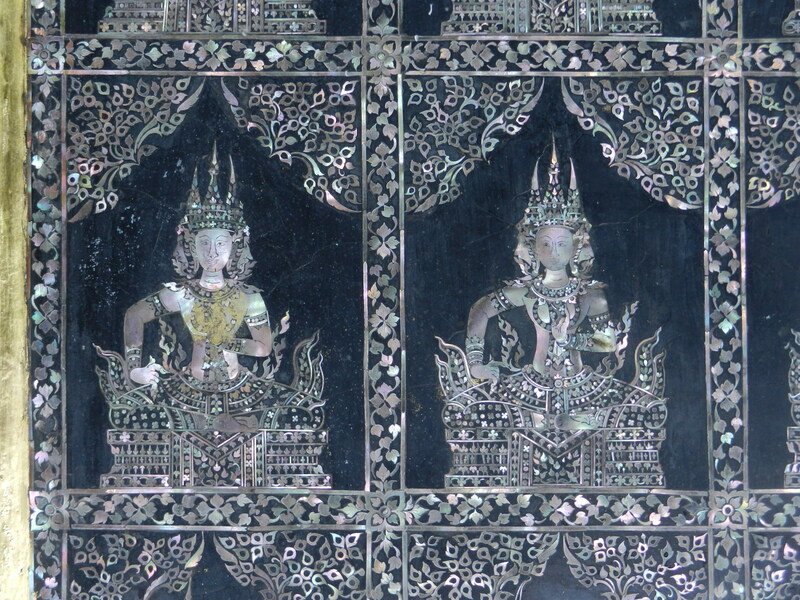 I wrote an earlier post on the Buddha’s footprint at Wat Pho, but I took the photos more than 5 years ago with a 35mm camera. I took a better set of shots this time, and they show how Thais turn big things and ideas into their terms–into small spaces that are both beautiful and fun. 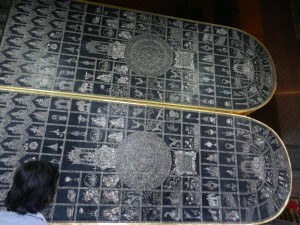 Standard images in Wat Pho’s Buddha’s footprint are the 108 auspicious signs, the wheel of Dharma (you can see it in the center) and Mt. Meru with a palace on top (in the heel). 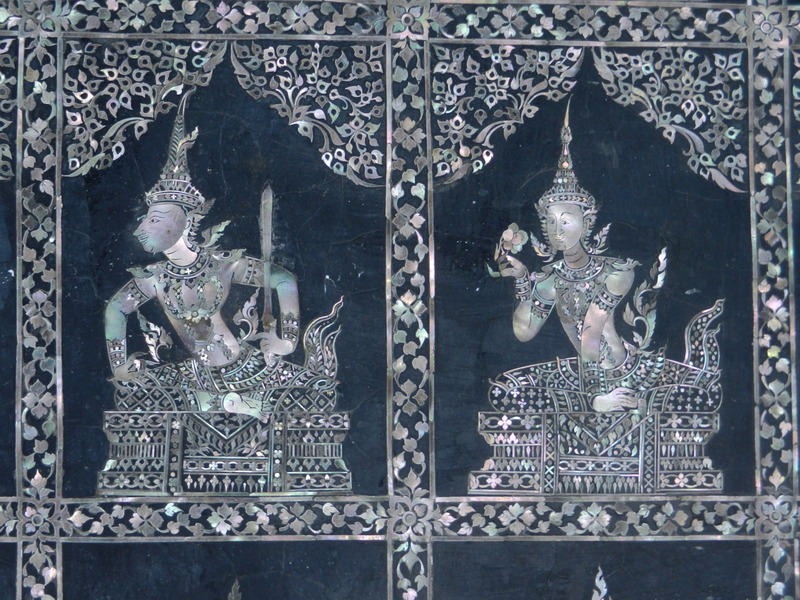 But look how Thais used mother of pearl inlay to make all this symbolism both shimmering and dainty. Many divinities surround the wheel of Dharma. The ones above are frontal and stately, like meditating Buddha’s. But these are more animated. Like a lot of Thai art, heaven is both stately and fun. And it gets even more fun. These half bird-half human figures are called kinnari. 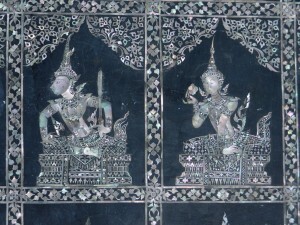 They’re celestial musicians and lovers, and among the 108 auspicious signs. These images translate the huge Indian cosmos into the most elegant lines and soft shimmers imaginable. But we’ve only seen a small sample of these images. 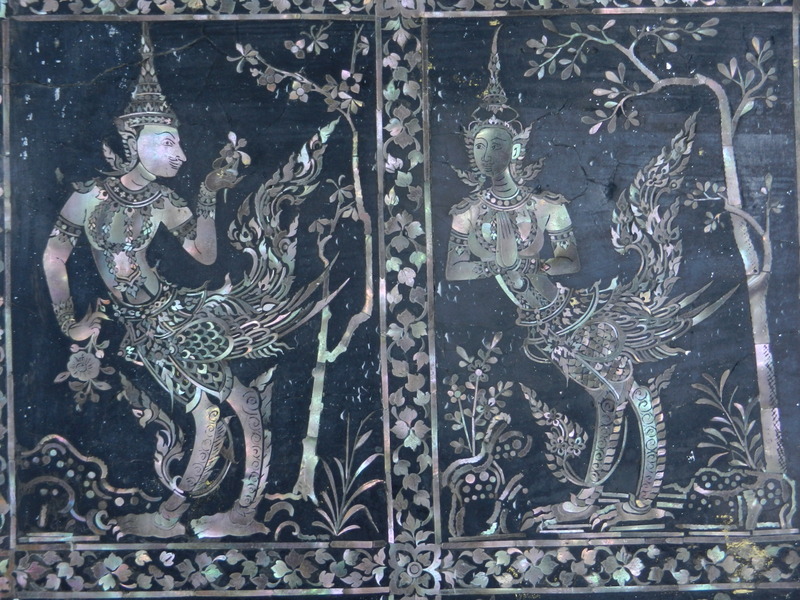 A key thing about Thai aesthetics is the more you examine a Thai work of art, the more enchantments you find. 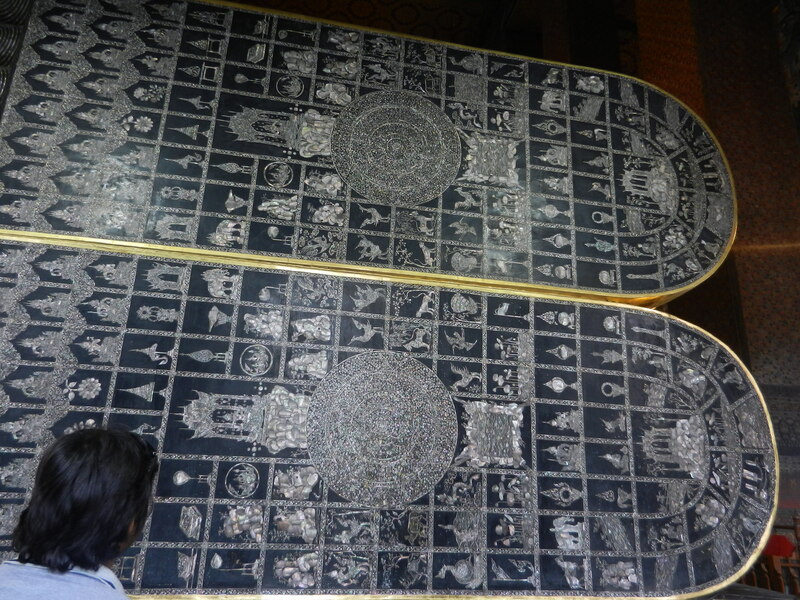 We’ll explore more of the Buddha’s footprint, with eye-candy photos, in the next post on the Buddha’s footprint at Wat Pho. Sir, for over 20 years I have attempted to obtain more detailed on this pada, but have failed. I am glad someone notes it as being GREAT. It is based on the Lan Na Pali text: Pathama Sambodhi, but somehow or other, someone got off track. It does not follow any list of 108 that I kow of, even after 44 years of study. Well, such is life. Thanks again.